Introduction: Weight regain after bariatric surgery is a controversial issue. Some authors argue that this happens because of dilated gastric pouch, others because limb length, hormonal reasons etc. Concerning gastric volume, several procedures have been described to measure this volume. Three dimension CT scan is a reproductible and effective procedure to measure gastric volume. Objective: The objective of this study is to check if CT scan is an effective and reproductible way to measure the gastric volume. Material and methods: First of all we choose ten patients operated of gastric bypass in our centre. We performed three CT scans to every patient and we compared the different volumes that we got in every scan by a correlation statistic analysis. 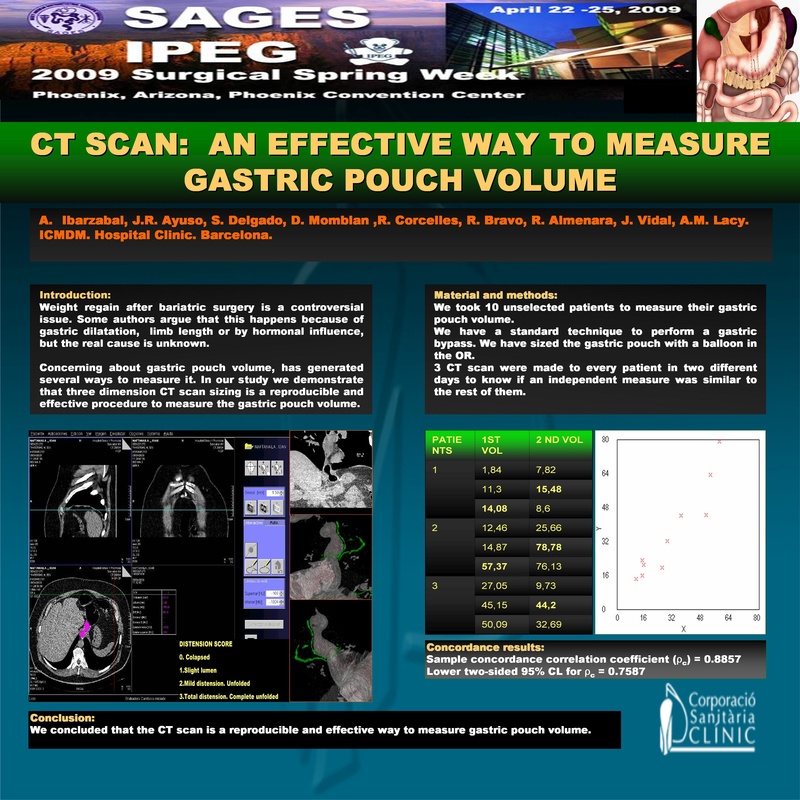 After we concluded that the CT scan is a reproductible and effective way to measure gastric volume, we measured the volume of the pouch in the operating room (with a balloon) in two patients and we performed a CT scan getting similar results. Concussions: CT scan is an effective and reproductible way to measure gastric pouch´s volume in patients with gastric bypass.